I got an excellent haul of NYX products from cherryculture.com and I have to say, I'm really happy with my purchases this time. 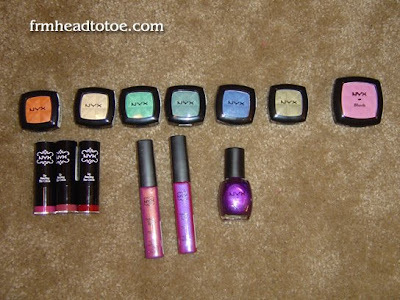 Those who follow the blog know I am a huge fan of NYX products and this was no disappointment. I decided I needed some better blues in my shadow collection and my favorite of the blue/greens I got was Atlantic which is a gorgeous deep, bright blue. Also, and after seeing this adorable hot pink look on the nyx website (and in lots of magazines) I really wanted a good hot pink lipstick and blush. 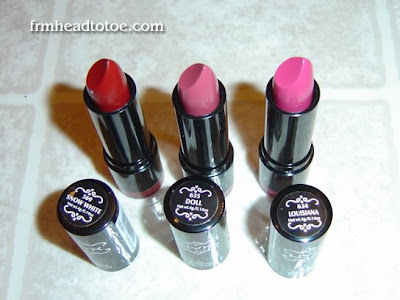 Louisiana is perfect for the lips and Pinky is okay... no dupe of this really hot pink MAC creme color base a makeup artist used on me once, but still nice and pigmented. I'll definitely try to recreate the look soon. Hello, this is on a completely unrelated matter, but I am looking for natural-looking colored contacts and I was wondering if there were any options out the besides the sol.. [sp] ones...like the ones that don't have a design on them but instead a faint tint, but provide a nice, natural color. Thanks. that looks like a great haul! 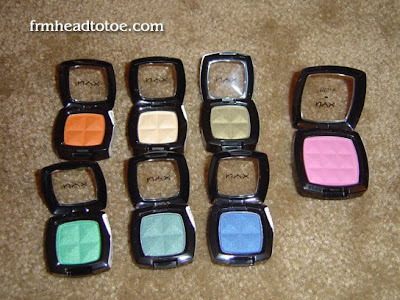 those eyeshadows look really nice.